Moog Minimoog synthesizer ad from page 18 of Contemporary Keyboard Magazine July 1979. Moog took some time off from promoting their Polymoog, Multimoog and effects gear to pay proper tribute to their golden child. Believe it or not, this is the first Minimoog ad that I've put up on the blog. And before you ask - no, the scanner didn't miss anything. This is Moog's most minimalist ad ever. No famous people or free stuff. The ad copy is simple and effect and the outline of a Minimoog is still synonymous with synthesizers. Could you imagine any company BESIDES Moog trying to pull this off today? Seriously, anyone even remotely familiar with vintage synthesizers can immediately pick out the back-lit Minimoog your favourite musician from the 70's, 80's, 90's, or 00's is playing onstage as soon as the curtain goes up. This ad is like one of those 3-D puzzles found in the comics section of a newspaper. When I stare at it long enough, my vision gets blurry and I see Devo pop out at me. I'm going to stop typing now and stare some more. Oh! hello Mr. Mothersbaugh! It's brilliant because it creates brand cache simply by putting the reader into one of two categories - those who know what it is at a glance (and can feel smug about it), and those who don't know but need to find out asap (lest their friends in the first group find out). Fantastic ad - very clever and confident! 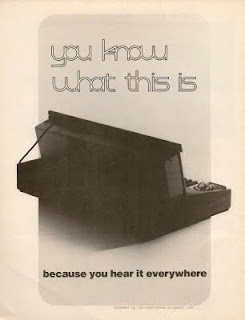 Note the font of the "you know what this is" is done in "Moog" letters - ahw my goat, I love these 70's vintage ads! Will you post the "Moog for road" mid seventies minimoog brochure, please??? Nice blog - have a happy new year!